I believe that Ira Sokol’s post about assistive technology for students with disabilities and the discrimination against them by school administrators is the best piece of blogging about ableism I’ve seen in some time. Sokol, whose blog is called SpedEdChange has titled his post “Beyond Disability” and in it he does a marvelous job of demonstrating how all technologies are assistive technologies (especially for people that imagine they don’t have physical problems) and in turn the bias against students reading with accommodating technology is both silly and yep, driven by moneyed interests. What bias, you say? You will need to read Ira’s excellent piece for a fuller treatment but here’s the deal: technologies that put people with disabilities on the educational playing field are still keenly distrusted by ableist types who imagine that some kind of cheating is going on. We don’t have to descend into a lecture about Social Darwinism but the general idea is the old canard that accommodations in the classroom may give a special ed kid an unfair advantage. Sokol does a good job of showing how the outrage against Oscar Pistorius is the same outrage directed at learning disabled children who use educational software. I have been the recipient of these discriminatory ideas all my life. Once, in graduate school a professor told me that if I needed extra time to read for his seminar I didn’t belong in his class. And the fights my mother had to undertake to get extra time for me when I took the SAT exams back in 1977 were both epic and humiliating. (Remember the dark days before the ADA?) Nowadays the rights of blind people to use AT are generally understood though the application and inclusion of that technology in classrooms is still a hard fight. In baseball the catcher’s mitt is an accommodation. Does he have an unfair advantage? The player who is thrown out trying to score might think so. But if you think this analogy is invidious, think again. 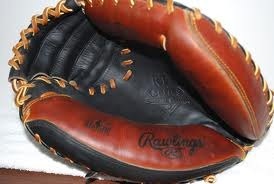 The catcher’s mitt has extra padding to absorb the velocity of thrown pitches. That’s it’s advantage. The disadvantage (as any catcher will tell you) is that the glove has no pocket. A good catcher knows how to hold the ball in the glove. A good catcher has the strongest hands of any player on the field. He has adapted to his accommodation. Going to public schools in the 1960’s my only accommodation was having people read to me. My version of the catcher’s hands was to develop a capacity to remember what I was hearing. Good for me. I did what I had to do. All kids with disabilities take what they have and use it to the best of their abilities. The ultimate ableist would say that I had a special advantage over kids who were reading the print off a page because I had extra time. I had someone read to me—once, and once only. Yipper! I had one hell of an advantage. And of course this reactionary confusion is the point. We don’t know what education means. We don’t know what individuality means. Our current system is adapted from the Victorian idea that public ed will prepare a child to work in the merchant classes. Reading, writing, and arithmetic are essential to being a shop keeper. In the years after World War II (with the advent of the G.I. Bill) a new expectation came of age in America: people from the lower classes felt that higher education was possible and within their grasp. We all know that higher education requires you to work hard. This is one of its signature qualities. Hard cerebral work will help to make a woman or man a critical thinker. But all too many educators still don’t know what the process of work—raw, tough, persistent mentation—really means. There are many educators who still don’t know what educational work—acquisition of knowledge “means”. In large part this is because education departments at colleges and universities have often failed to imagine the educational possibilities that can be realized beyond standardization. And lest you imagine that this is a philosophical problem I would counter by saying it’s a problem of capital. One must imagine that disability is a form of hunger. One must think of food as a reasonable accommodation. One must think of food as a human right. Like my baseball analogy the comparison will appear invidious until one thinks of the environment of learning. When I use my assistive technology I am working in a different relationship to the page—think of this as my intellectual metabolism if you will. I am taking in and breaking down information according to the capacities of my body. We scarcely know what the body means when we discuss the acquisition of educational skills. I guarantee you that most education departments are not talking about it. Denying students the proper technology and learning methods amounts to denying them food. One thinks of Paolo Freire who observed that as a child in poverty he couldn’t learn: “I didn’t understand anything because of my hunger. I wasn’t dumb. It wasn’t lack of interest. My social condition didn’t allow me to have an education. Experience showed me once again the relationship between social class and knowledge"
It costs money to put assistive technology and special ed teachers in the mainstream classroom. It’s far easier to deride accommodations as representing an unfair advantage to LD students than it is to recognize the connections between disability and the social mechanisms that create and recreate it.